There is still time to get some sun and fun this summer, at a great last minute price on all parks in Europe. 7 night holidays from just £199 per party! Keycamp holidays are disappearing fast but there are still some great deals including 7 nights from just £199 per party. Book now before they’re all gone’. But with availability going by the day, hurry and book now to avoid disappointment. The World Cup may be over, but South Africa remains a popular holiday destination. Ebookers have teamed up with South Africa’s leading hotels to bring unbeatable Hotel deals to you. 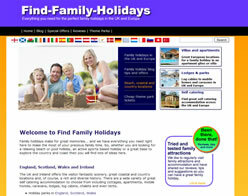 From Monday, 19th July until 22nd August 2010, they are offering up to 50% savings on top South African hotels.